Check it out. All the books I’ve read toward my 2013 Goodreads challenge. It looks pretty impressive, even though I was shy of my goal by two books. I’m not going to make it this year. In my defense, I re-read one book, Bared to You, at the beginning of 2013 and apparently that doesn’t count towards the challenge. I also branched out a little more, trying new things, and that turned into six books that I started and did not finish. I am still on hiatus, but I did renew my Writer’s Market subscription in preparation for the new querying process that I am still putting off. No need to rush into the second round of rejections, right? I’ll wait until next year on that one. When I was in the first grade my teacher held some kind of drawing were the winner got a record or tickets to the circus or something. I don’t remember exactly what the prize was, because I didn’t win. What I do remember is that the girl who did win started crying when her name was called. As she stood in front of us to collect her prize, just blubbering away, the rest of us, sitting cross-legged on the floor, were all looking around at each other like “WTF?” (Okay, technically this was way before WTF was a thing, but you get the picture.) “Why is she crying?” someone finally asked out loud. “Because she’s happy,” the teacher said. As if this were perfectly natural. None of the rest of us thought it was perfectly natural. I thought it was just plain nuts. Until this last Friday, when I finished watching the final episode of Nikita. Reformed political assassin Nikita has joined forces and is on the run with her lover and former adversary, Michael. Her student and partner on the inside, Alex, has turned against her and is now her greatest enemy. The secret killing organization Division is now being headed by the very scary interrogator Amanda. Season 2 is about to get interesting. Why I’m Hooked: Tight, thrilling plots about redemption and moral duality executed by forces to be reckoned with. Then there is Nikita herself, whose combination of empathy and single-minded drive to right her past wrongs are in stark contrast to the tough, ruthless killer that made her so valuable to Division to begin with. Friday, December 27, 2013 marked the end of the fourth and final season of this fantastic modern day hero’s journey. The fourth season was only six episodes that aired over the – hello, nobody’s home! – Thanksgiving and Christmas holidays, but the fans and critics figured we were fortunate to at least get that. You know, as opposed to no season 4 at all. And at the end, when the final scene faded to black and I hugged myself and cried because all of my beloved characters completed their journeys so magnificently, I figured I was fortunate and happy. 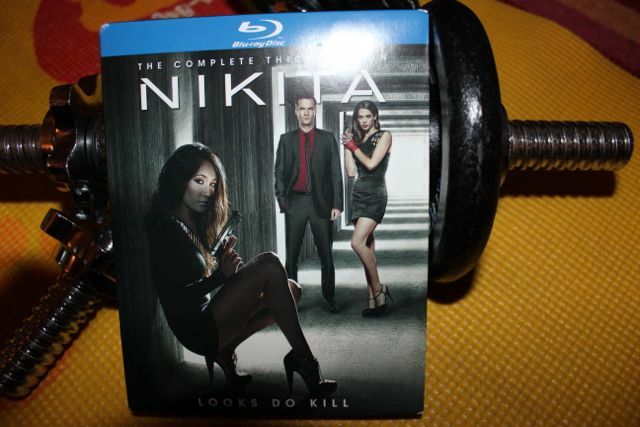 Besides, I own seasons 1–3 on Blu-Ray, so even though the series has concluded I can still lift weights to Nikita on Sunday mornings. As long as I feel like. Which could be forever. How was everyone else’s 2013?